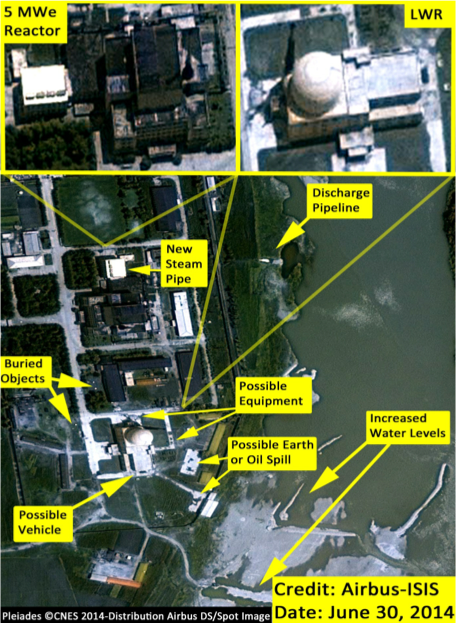 Commercial satellite imagery dated June 30, 2014 shows that North Korea’s 5 megawatt-electric (MWe) reactor at the Yongbyon nuclear site continues to be active while construction and the possible installation of equipment at the experimental light water reactor (LWR) continues. Additionally, movement of material, a new piece of roofing, and several other renovations have been detected at the fuel fabrication and uranium centrifuge complex located in the southern part of the Yongbyon nuclear site. Overall, North Korea’s priorities at Yongbyon appear to be the 5 MWe reactor (plus likely associated plutonium separation plant) and the gas centrifuge plant. North Korea has apparently made a decision to renovate the aged 5 MWe reactor to make plutonium for nuclear weapons for many more years and is expanding the centrifuge plant. The June 30th satellite imagery, combined with procurement data obtained by ISIS, suggests that North Korea is emphasizing the production of weapon-grade plutonium as well as enriched uranium for its nuclear weapons program. The start-up date of the experimental LWR remains uncertain; it is certainly delayed given North Korea’s earlier statements of a start-up by the end of 2012. Once operational, this reactor could produce several times more plutonium than the 5 MWe reactor. The June 30th commercial satellite imagery shows that water is being discharged near the 5 MWe reactor, implying that it is operational. This discharge was detected also in previous imagery dated August 2013 and April 2014 (see here and here). This outflow water is being discharged into the river through a pipeline buried east of the reactor. ISIS assesses this discharge is part of the 5 MWe reactor’s secondary cooling system. The primary cooling system involves carbon dioxide. The water in the secondary cooling system cools the carbon dioxide gas heated by the reactor’s operation, producing steam for electricity production and hot water that is discharged into the river. Contrary to what has been published by 38 North,1 ISIS assesses that the reactor’s secondary cooling system likely receives water from a pump house north of the reactor and discharges it into the river through a pipeline buried east of the reactor (see here). This pump house is located north of both of the reactors’ discharge pipelines and in an area that does not have a sand bank that suffers from rising and lowering sand and water levels (unlike the area south of the reactors). This is a much better location for water intake purposes because it assures a reliable source of water for the 5 MWe reactor’s secondary cooling system. It is also possible that this pump house will supply water for the LWR’s secondary cooling system. The discharge of water from the 5 MWe reactor’s secondary cooling system between August 2013 and June 2014 could signify on-going operation of the 5 MWe reactor. However, without more data, such as regular steam production, it is hard to determine the operational status of the reactor and thus to estimate the amount of plutonium produced by the reactor. However, it is reasonable to assume that North Korea is renovating this reactor so as to achieve the reactor’s previous level of plutonium production. One indication of renovation is that North Korea has apparently remodeled the reactor’s cooling system, including replacing a steam line out of the reactor. Commercial satellite imagery may show evidence of this work. In August 2013, ISIS detected two columns of steam rising from a building adjacent to the 5 MWe reactor (see full analysis here). However, between May and June 2013 North Korea installed what appears to be new piping and Google Earth imagery dated December 31, 2013 clearly shows steam venting in this area (see figure 2). For the last few years, North Korea has been procuring equipment for the 5 MWe reactor. These procurements are related to replacing aging equipment in this reactor and ensuring that it can manufacture additional fuel for it. Construction activities continue at the site of the LWR. Several new unidentified objects appear there in recent imagery. A series of objects, possibly equipment, appear lined up on the road leading to the reactor while another object, or possibly a large black vehicle appears at the south end of the reactor. Another unidentified object, possibly a large container or a larger piece of equipment, appears immediately north of the reactor and possible oil or earth spills are visible south east of the reactor. Also, three large cylindrical objects, that had previously been placed into the ground north-east of the reactor, have been buried. These objects seem to be tanks but it is unknown whether they are to be used as water or waste/toxic tanks. Finally, the river water levels have increased, modifying slightly the structure of the bank. The start-up date of the reactor remains unclear. North Korea has not updated information about this reactor during the last few years. A senior North Korean nuclear official stated in late 2011 that the reactor was expected to be finished by late 2012 or early 2013, although he acknowledged that finishing the reactor would be difficult. However, the reactor is still not operational and the available satellite imagery does not provide a reliable basis to estimate when the reactor may start. But the delays in operation raise the question of whether North Korea has experienced difficulties finishing the plant or is less committed to its completion. Recent commercial satellite imagery shows construction activities continuing in the area of the Yongbyon centrifuge plant located on the southern border of the Yongbyon site. North Korea has stated that this enrichment plant is dedicated to making low enriched uranium (LEU) for the LWR but it is also suspected of being involved in to the production of low enriched uranium that is intended for further enrichment to weapon-grade at this site at Yongbyon or at another centrifuge plant located elsewhere. 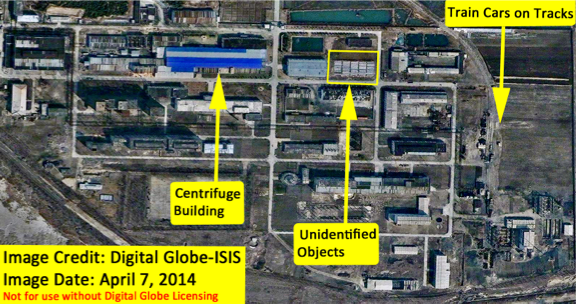 An August 2013 ISIS Imagery Brief showed that North Korea nearly doubled the size of the gas centrifuge building. 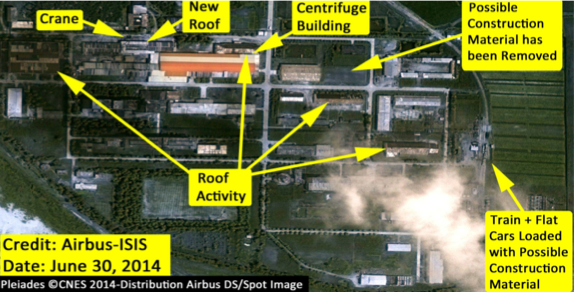 A subsequent December 2013 ISIS Imagery Brief showed that an additional section of the old roof of the centrifuge building had been renovated. In April 2014, commercial satellite imagery showed no external signs of major activity at the centrifuge building. However, several objects, possibly construction objects, appeared close by. Recent imagery dated June 30, 2014, again shows no signs of external construction activity at the centrifuge building. However, there are several other signs of activity nearby. The possible construction objects detected in April 2014 have been removed. Second, a new roof, seemingly connecting two buildings that were previously separated by a small road is being built immediately north-west of the main centrifuge building (a crane is also visible here). Third, roof activity is taking place at several other buildings on site. It is unknown whether these roofs are being renovated or dismantled. Finally, a train connected to three flat cars carrying several 3x1.5 meter cylindrical objects, possibly construction material, is clearly visible on the tracks (see figures 3 and 4). It is likely that during this year, North Korea has been installing centrifuge cascades inside the new section of the centrifuge building. However, it cannot be determined whether North Korea has finished the expansion of this centrifuge plant. Figure 1. Airbus imagery showing North Korea’s Yongbyon 5 megawatt-electric (MWe) and experimental light water reactors on June 30, 2014. Figure 2. Digital Globe and Google Earth imagery showing the 5 MWe reactor and steam venting between May 15, 2013 and December 31, 2013. Figures 3 and 4. Airbus imagery showing the status of North Korea’s Yongbyon Fuel Fabrication Complex on April 7, 2014 and June 30, 2014, respectively. The bright blue and orange roof on the centrifuge plant are the same color in reality: the coloring of this roof in the images differs because of the different analytical methods used to visualize each image, namely the layer combination used in each image. 1 See “Satellite Images Show New Construction at North Korea’s Plutonium Production Reactor; Rapid Restart?” April 3, 2013, and “North Korea’s Yongbyon Nuclear Facility: Problems Continue with Reactor Operations,” July 18, 2014.